Using a model similar to what meteorologists use to forecast weather on Earth and a computer simulation of the physics of evaporating ices, a new study published in the journal, Nature by York University's Professor John Moores, Department of Earth and Space Science and Engineering at York's Lassonde School of Engineering, has found evidence that snow and ice features previously only seen on Earth, have been spotted on Pluto. "Penitentes" which are formed by erosion, are bowl-shaped depressions with spires around the edge, and are several metres high. 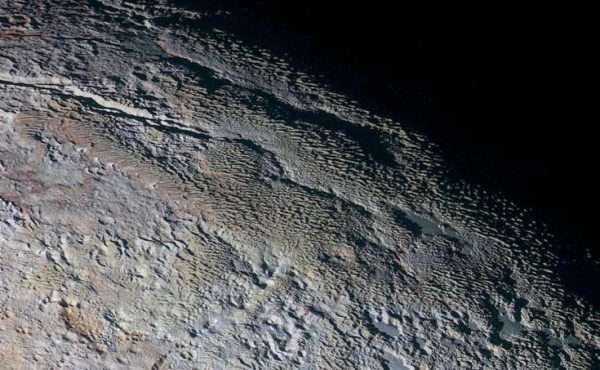 "The identification of the ridges of Tartarus Dorsa as Penitentes suggests that the presence of an atmosphere is necessary for the formation of penitentes, which would explain why they have not previously been seen on other airless icy satellites or dwarf planets," says Moores. "But exotic differences in the environment give rise to features with very different scales. This test of our terrestrial models for penitentes suggests that we may find these features elsewhere in the solar system, and in other solar systems, where the conditions are right." Moores, along with his York postgraduate fellow, Dr. Christina Smith, Dr. Anthony Toigo, at the Applied Physics Laboratory, Johns Hopkins University and NASA Research Astrophysicist, Dr. Scott D. Guzewich, at the Goddard Space Flight Center in Maryland, USA compared their model to ridges on Pluto imaged by the New Horizons spacecraft in 2015. Pluto's ridges are much larger - 500 metres tall and separated by three to five kilometres - as compared to their meter-sized earthly counterparts. "This gargantuan size is predicted by the same theory that explains the formation of these features on Earth," says Moores. "In fact, we were able to match the size and separation, the direction of the ridges, as well as their age: three pieces of evidence that support our identification of these ridges as penitentes." Moores says though Pluto's environment is very different from the Earth - it is much colder, the air much thinner, the sun much dimmer and the snow and ice on the surface are made from methane and nitrogen instead of water - the same laws of nature apply. Both NASA and Johns Hopkins University were instrumental in the collaboration that led to this new finding. Both provided background information on Pluto's atmosphere using a model similar to what meteorologists use to forecast weather on Earth. This was one of the key ingredients in Moores' own models of the penitentes, without which this discovery would not have been made. Penitentes are not caused by erosion as the author claims, unless sunlight sublimating snow is included. I have not seen sunlight as a cause for erosion in any definition of erosion I have read. ".. Ice on the surface are made from methane and nitrogen .."
Correct is: ..ice on the surface are made from nitrogen and a little methane ..